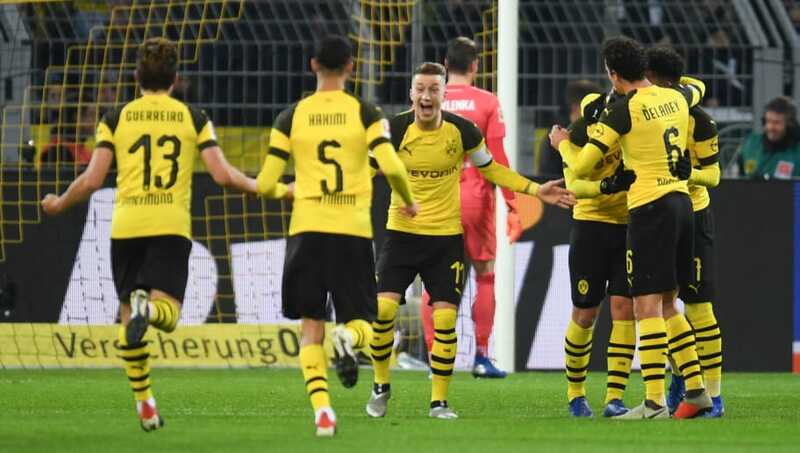 ​Borussia Dortmund will be looking to strengthen their hold on top spot in the Bundesliga when they travel to lowly Fortuna Dusseldorf on Tuesday evening. The hosts are languishing towards the bottom of the table having amassed just 12 points all season, whilst BVB are flying high in first - nine points clear of second place. Both sides are coming into this one having picked up three points at the weekend, with Dusseldorf defeating Freiburg 2-0 and Dortmund overcoming Werder Bremen with a narrow 2-1 win. Here's 90min's preview of Saturday's game. ​Dusseldorf have quite an extensive injury list with the likes of Andre Hoffman, Marcel Sobottka, Diego Contento and Raphael Wolf all out of action. ​Dortmund are almost at full strength, with their only concerns being injuries to both Dan-Axel Zagadou and Jacob Bruun Larsen. After a busy week of fixtures, Lucien Favre may be persuaded to make one or two changes to his usual starting XI in order to rest some of his first team stars. ​Fortuna Dusseldorf ​Rensing; Zimmermann, Ayhan, Kaminski, Gießelmann; Usami, Stoger, Bodzek, Raman; Karaman, Hennings. ​Borussia Dortmund ​Burki; Piszczek, Akanji, Diallo, Hakimi; Weigl, Witsel, Sancho, Gotze, Pulisic; Alcacer. When it comes to head to head results, it has been hard to separate these two sides in the past. Dortmund narrowly have the edge, winning 16 games compared to Dusseldorf's 14, with eight games finishing in draws. Their last encounter was back in 2013, where Dortmund prevailed 2-1 at the Esprit Arena. Dusseldorf's recent form has been somewhat erratic, but they have managed to pull off a few decent results. Their most notable was a remarkable 3-3 draw with ​Bayern Munich last month where they were able to recover a three-goal deficit to earn themselves a point. Dortmund have been incredibly consistent so far this season, exhibited by their recent run of results. They are unbeaten in their last five matches, with the only blip on their record being a goalless draw against Club Brugge in the Champions League. Given how ruthless Dortmund have been this season, it would take a very brave individual to bet against them in this one. BVB have been free scoring and, although Dusseldorf have caused a few surprises this season, they would do very well to maintain a clean sheet on this occasion. Dusseldorf may cause one or two problems, but Dortmund's unbeaten domestic campaign should continue.